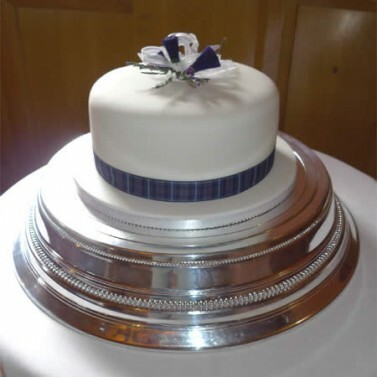 The decoration of this lovely wedding cake is based on a Scottish theme... the cake topper is made by hand from a variety of silk floral elements, including thistles, heather, ivy leaves, rosebuds and bows of purple organza ribbon. (Note: small variations in decoration can occur due supplier availability). To finish the decoration process the cake is wrapped with a 1" wide tartan ribbon. Based on an 8" cake, once coated with marzipan and icing, this Scottish-design wedding cake's dimensions are approx. 8 ½" diameter x 2 ½" high. The cake is then mounted on a coated ½" thick cake board and finished with a picot-edged satin ribbon.